Spellcasting Heartless. They heal themselves and other Heartless with Cure. They are slow-moving, but hover high in the air and absorb most magic attacks. A magic-wielding Heartless that drifts through the air. It doesn't attack, but it can cast Cure to heal other Heartless. The Green Requiem is slow, but is healed by basic elemental magic, making it tough to squash. Spell-slinging Heartless that drift in midair, ready to cast Cure magic if one of their cohorts' HP drifts into the red. They can heal themselves, too, and will try to flee if you attack them. Good thing they don't have much HP. Increases the potency of Cure abilities. 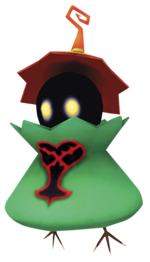 The Green Requiem is an Emblem Heartless that was introduced in Kingdom Hearts. A Green Requiem has a smooth, conical body that is a light shade of green and has a Heartless emblem is emblazoned on its chest. The top of its body flares outward and forms a jagged "collar" below the Heartless's spherical, pitch black head. It also wears a conical, orange hat that has a jagged brim and a thin, curled tip. Like many Heartless, the Green Requiem has glowing yellow eyes. Its seemingly useless feet sport three small, thin toes. 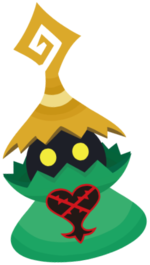 Like other Heartless in its family, the Green Requiem's name is comprised of a color—in this case, green—and a musical term—in this case, a requiem, a piece of music composed to honor a dead person. This is fitting, given the Green Requiem's ability to heal other Heartless. A good way to defeat Green Requiem is to equip High Jump and Aerial Sweep, then jump and attack. It is also important to note that they absorb all magic spells. In Kingdom Hearts Chain of Memories and Kingdom Hearts Re:Chain of Memories, do not equip attack cards with passive elements, like Lionheart and Photon Debugger, as using these cards to attack a Green Requiem will heal it. In Kingdom Hearts, additional Tech Points can be earned by casting Gravity Magic. ↑ x0.8 after rescuing Kairi. ↑ x0.6 after rescuing Kairi. ↑ Before Kairi's rescue, for casting Gravity magic, 2 Tech Points can be earned in Kingdom Hearts Final Mix. ↑ After Kairi's rescue, for casting Gravity magic, 9 Tech Points can be earned in Kingdom Hearts. This page was last edited on 19 April 2019, at 18:59.